Become a wildlife expert as you encounter legendary creatures in Find It® Wildlife, new in 2014. This Contained Adventure™ features 40 animals and safari-related items concealed in colorful pellets that mimic the savannah. View a lion, a giraffe, a cheetah, a gazelle , a Baobab tree, and even a warthog inside this hidden object game. Find It® Wildlife includes two-sided playing cards to provide even more playing options for one or more animal lovers to enjoy, whether you are 8 or 98! 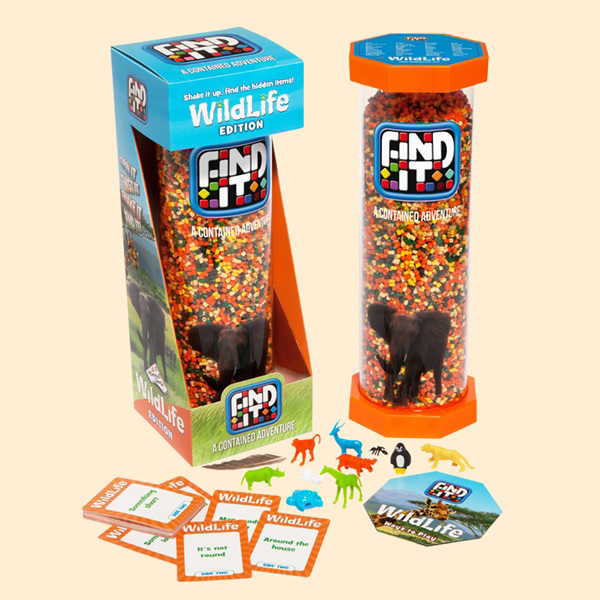 Package includes the Find It® Wildlife hidden object game, playing cards and Ways to Play sheet.